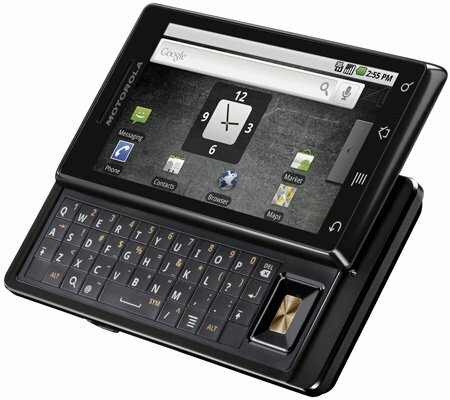 I had a Nokia N97 for 2 months and now it’s 2 months since I’m with the Motorola Milestone (A853) , the famous Droid ! I expected to spend these 2 months of use to write a comparative article that was fair, having the same time of use in each of the devices. 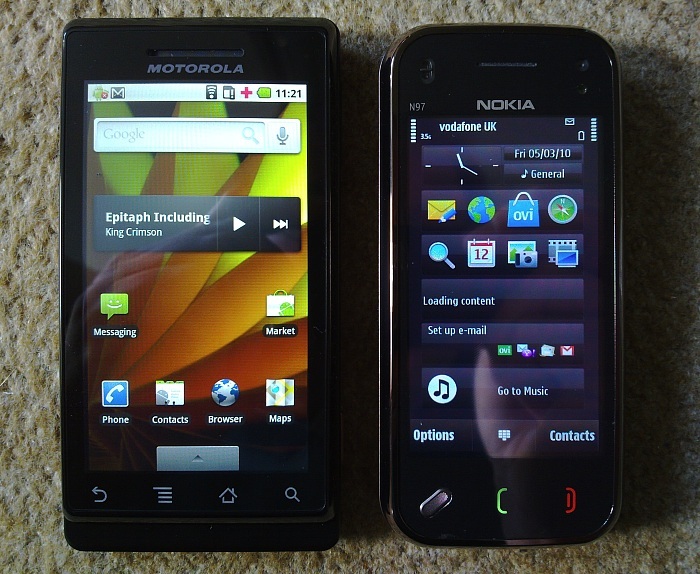 The comparative Nokia N97 x Motorola Milestone is separated according to the points that I considered most relevant. To make reading more enjoyable I will avoid entering into technical details, focusing more on the results obtained. The screen of both phones is touch-sensitive, but Milestone’s is multi-touch! 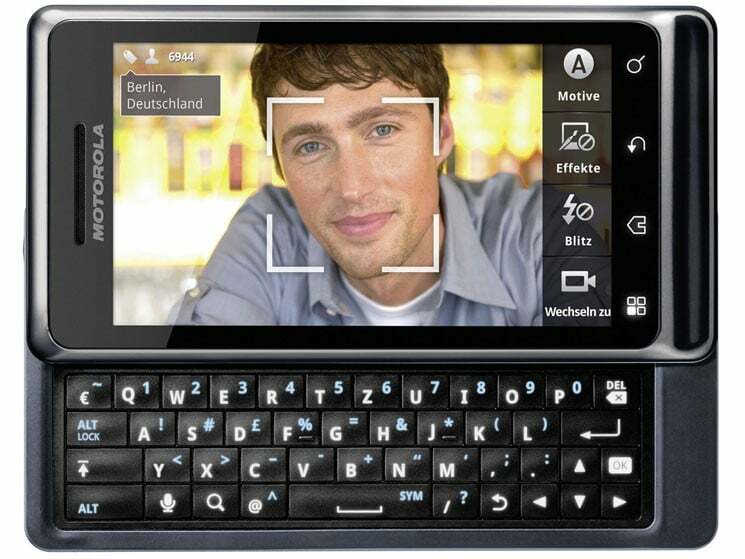 The screen of the N97 is 3.5 “and that of the Motorola Milestone is 3.8”! 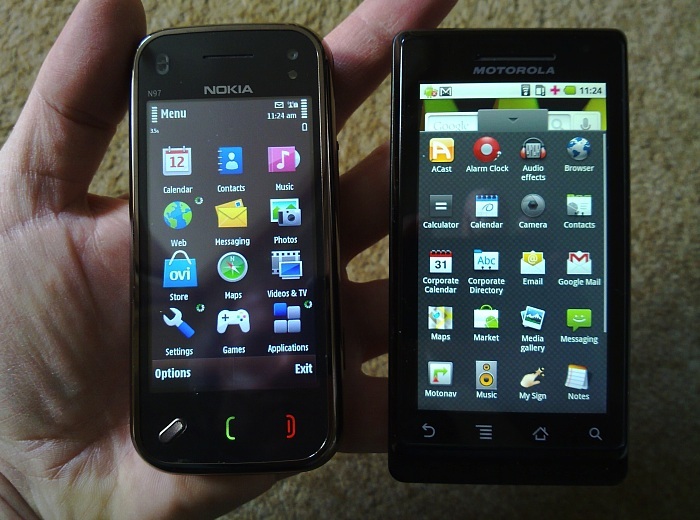 In addition to being larger, the Milestone screen has a huge resolution of 854 × 480, versus 640 x 360 pixels of the Nokia N97. This higher resolution allows you to view HD-quality videos on YouTube or even convert movies to run on your mobile phoneusing Format Factory. All icons have better definition and, because of its higher resolution, Milestone allows you to display very small texts in a way that fits most web pages in one screen, without a scrollbar or resizing. Looking at the numbers thus it may seem that the difference is small, but the N97 loses ugly in this question. 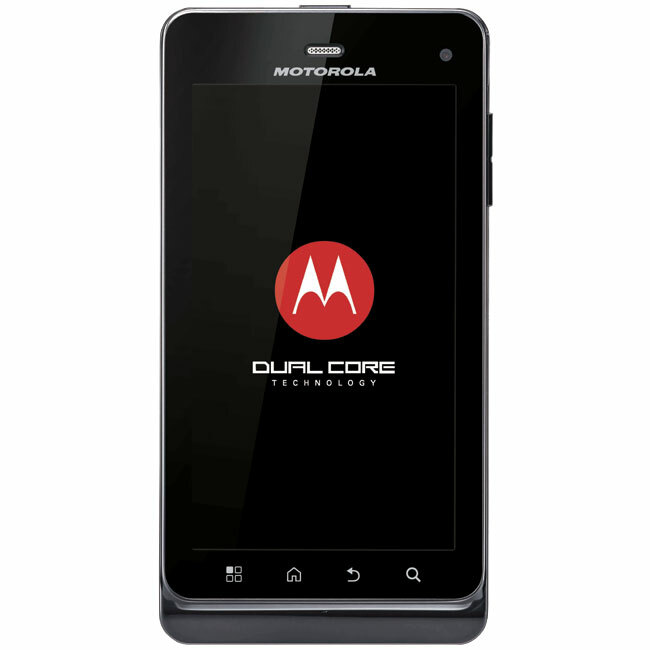 In addition to the higher screen resolution of the Motorola Milestone, the sensitivity is far superior. It’s no exaggeration to say that if you use the Milestone first and then switch to the N97, you’ll think there’s some flaw in the N97 touch screen. Much of the responsiveness of the Milestone screen is thanks to the faster processor and more evolved operating system. On the screen, the Milestone is incomparably better than the N97! Taste is not discussed? It may even be … but the N97 pleased me a lot. The Motorola Milestone is more square, all black without many details. 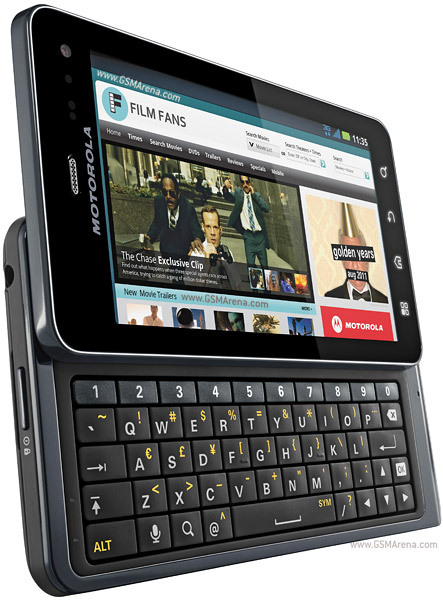 The side buttons of the Motorola Milestone are not easy to distinguish using touch, which in the N97 is quite easy. The locking screen of the Nokia N97 is made by an easy-to-find side key, which must be moved laterally and returned to its original position after being released. In Motorola Milestone, this key is in the upper position of the device and is not always easy to find and operate using one hand. In the Nokia N97, the button that opens the options menu is a common, embossed button on the front of the device. 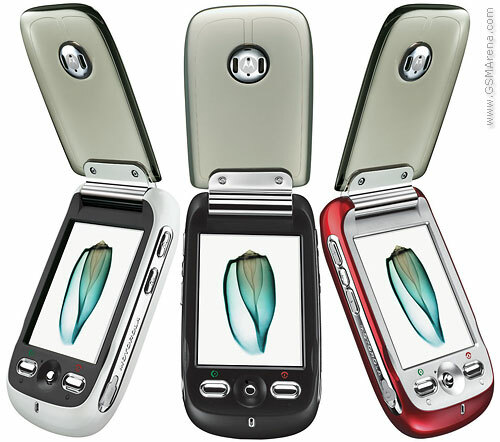 In Motorola Milestone there are no ordinary buttons on the front, only the designs of buttons that are triggered just to the touch. In the N97 the metallic details give a modern appearance to the device, contrasting with the classic black of the Motorola Milestone. 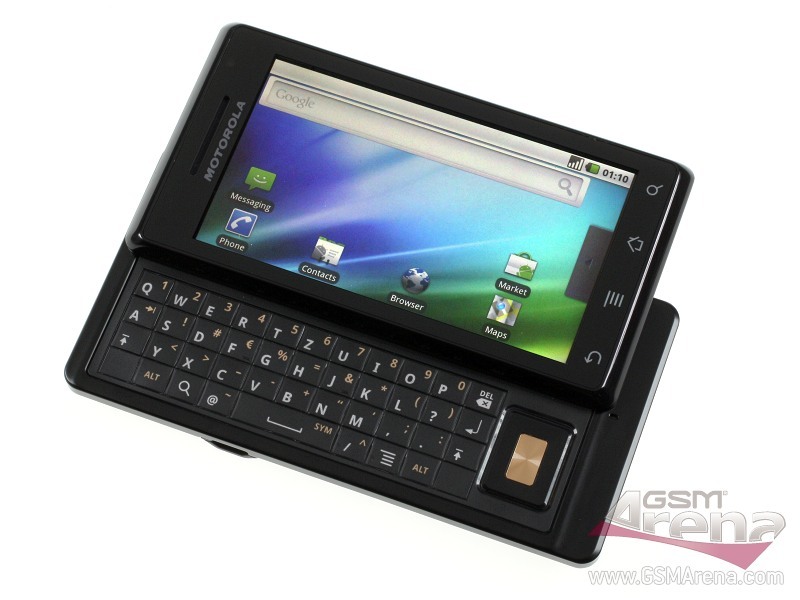 The way the keyboard slides is also much more original on the N97, leaving the device in a very interesting tilted position for reading or viewing videos. Weight is another factor that Milestone owes. It was already difficult to leave the N97 in the pocket during a race, now with the extra 15 grams of the Motorola Milestone, running with the phone is very unpleasant. 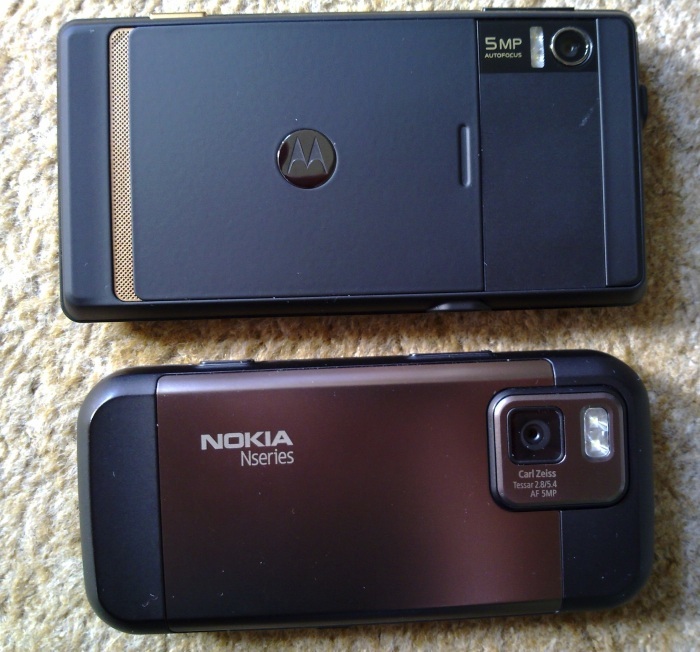 In my opinion, the Nokia N97 impresses more in design than the Motorola Milestone, due mainly to the functional part! Point to Nokia! It was already difficult to leave the N97 in the pocket during a race, now with the extra 15 grams of the Motorola Milestone, running with the phone is very unpleasant. 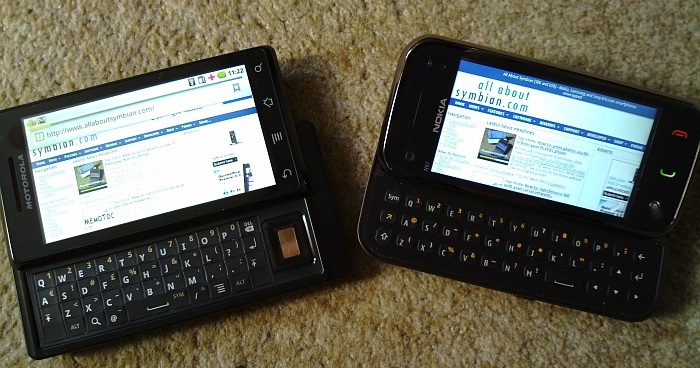 In my opinion, the Nokia N97 impresses more in design than the Motorola Milestone, due mainly to the functional part! Point to Nokia! It was already difficult to leave the N97 in the pocket during a race, now with the extra 15 grams of the Motorola Milestone, running with the phone is very unpleasant. In my opinion, the Nokia N97 impresses more in design than the Motorola Milestone, due mainly to the functional part! Point to Nokia! Without a doubt the N97’s keyboard is better. The keys are separate and easy to distinguish in touch. 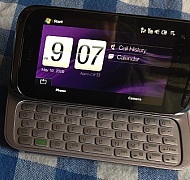 The way the keyboard positions itself when opened also gives a show on the Motorola Milestone. But using the Android operating system on Milestone has better usability, with more complete auto-completion feature, which makes typing in Milestone much simpler and more efficient. In addition to the physical keyboard, both devices have a software keyboard that appears on the screen when the physical keyboard is not open. In the N97 it is very discouraging to have to use this virtual keyboard. Typing is very slow and complicated, both because of the poor distribution of the displayed keys and the poor response of the touch screen. In Milestone, the virtual keyboard is so good that it is almost impossible to use the physical keyboard! Both handsets have a directional button. In Milestone it’s on the right side of the keyboard, which bothers a bit. In Milestone, in addition to the physical and virtual keyboard there is still a Wi-fi keyboard program, which allows you to enter texts in the browser to control the device. 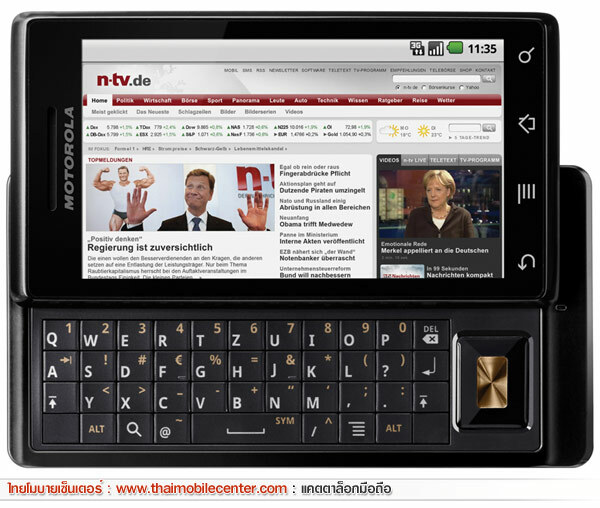 In short: the Milestone gains to the advantage of the N97 in the question of keyboard and typing of text. 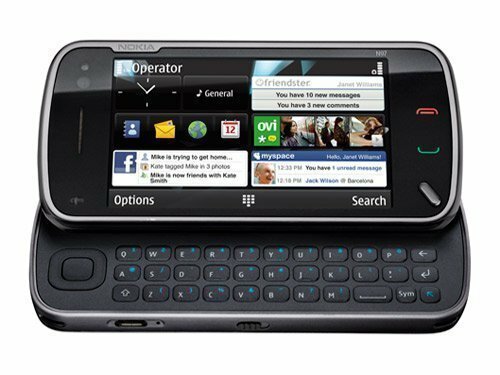 After typing an email or chatting with Milestone, doing the same task on the N97 is almost a disappointment! This includes the display of videos and music, whether stored on the device itself or via the internet on Youtube or any other streaming. The larger screen of the Droid makes the video experience much better on it than on the N97, but the N97’s speakers are excellent making the audio much superior. In Milestone, the audio coming from the speakers is low, being difficult to hear in traffic or in public places. Another fact in which the N97 stands out is the size of the internal memory: it’s 32 GB to store programs and various media files, among photos, videos and music! Both units have a micro SD memory card slot. On the N97, a 16GB card can be placed, expanding the memory to 48GB. In Milestone, the internal memory is small with only 256MB free for application installation, but it accepts memory cards up to 32GB. The Motorola Milestone comes originally with an 8GB micro SD card. While all these features lead to a “technical tie,” Motorola Milestone’s Android integration with Youtube and Picasa’s albums drive you to win in this respect as well! Not only can you view all Picasa albums but also sync photos with just a few clicks. Using the supplied headphones, the audio quality also matches. And finally in the multimedia question the N97 has the most the receiver and FM transmitter. They are very useful, but still do not make the N97 a unanimous choice. Motorola Milestone’s Android integration with Youtube and Picasa’s albums drive you to win in this respect too! Not only can you view all Picasa albums but also sync photos with just a few clicks. Using the supplied headphones, the audio quality also matches. And finally in the multimedia question the N97 has the most the receiver and FM transmitter. They are very useful, but still do not make the N97 a unanimous choice. Motorola Milestone’s Android integration with Youtube and Picasa’s albums drive you to win in this respect too! Not only can you view all Picasa albums but also sync photos with just a few clicks. Using the supplied headphones, the audio quality also matches. And finally in the multimedia question the N97 has the most the receiver and FM transmitter. They are very useful, but still do not make the N97 a unanimous choice. The N97 comes with Nokia maps and navigation software, which is free. The Droid comes with Motorola’s Motonav. Nokia Maps is undoubtedly easier to use and much better finished. The maps are more updated and the interface more polished. My experience with Motorola Motonav software left the impression that it was made for older generation handsets. The interface is slow and seems “tailored” to touch screen phones. In addition the Motonav is paid. The GPS hardware itself has some subtle differences, and I consider the Milestone a bit better than the N97 because it can pick up the satellite signal much faster and often even indoors, which was rarely the case in the Nokia N97. 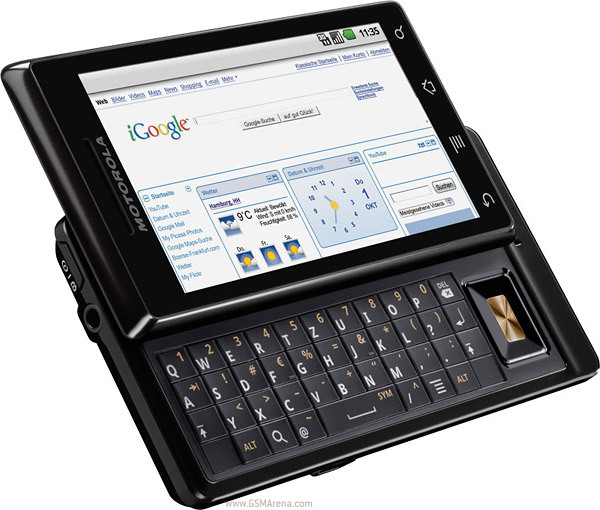 As long as Google does not allow maps to be cached in the device’s memory and allow voice navigation without a data connection, Android will lose out on Symbian, the operating system used in the N97. There are even other map software that stores all the maps on the device, but the usability is poor and the features do not even approximate those offered by Google Maps. In short: if GPS is very important Milestone is not a good choice, for now. 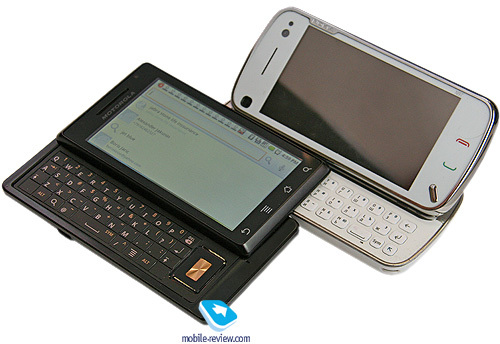 There is little to be said here because the difference is huge between the Symbian S60 of the N97 and Android 2.1, the latest version available for the Motorola Milestone when writing this article in July 2010. Android integrates with Google applications (GMail , Contacts, Orkut, Talk, Picasa, Youtube, Maps, etc …) easily and often natively, and also to other popular services like Twitter, Facebook and several others. Almost everything on Symbian is harder and time consuming to be done than on Android. It is clear that Android is a more modern and stable operating system than Symbian, which in turn seems to have undergone many adaptations over time and is now too bloated, with several functions and outdated concepts that can not be removed without have to start development again. If it were not only this, Android is already in version 2.2, which will soon be released to the Motorola Milestone, and as for the N97, there are no predictions of updates to your operating system! Droid gets fired on this one! Because applications are so connected to the operating system, Milestone is also much better at this point! The Android Market in Motorola Milestone allows you to install and manage thousands of applications in a fast and organized way. The Ovi Store by Nokia N97 is much slower and the amount of apps is much smaller. One more for Milestone! My Nokia N97 battery lasted longer than Milestone’s. You could stay up to 3 days sometimes without recharging with the N97, while it is necessary to recharge the battery of the Motorola Milestone almost every day . But this measure is not very precise no. I must take into account the fact that with Milestone, the prgrams work well in backgroud and this is reason to leave the Wi-Fi turned on all day. With the N97 I did not leave much running to avoid slowing the device down. So in this comparative battery does not serve as a criterion of choice between the handsets! As mobile phones are being compared, it is necessary to closely observe the management of contacts and connections. In Nokia N97 it is difficult to synchronize the contacts with some system online. For several times I tried to perform such a task and ended up with duplicate contacts or synchronized only the first time, without updating the changes made. With Milestone things were different: all the contacts were synced to Google, and just go to Google’s contact management pageto organize and merge some of the contacts. On Android you can mark the contacts as favorites and automatically the contacts you connect to are displayed after the favorite contacts. 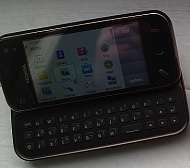 In Nokia N97, it takes more than 5 touch screen to call a contact that has 2 phone numbers, and the interface is very slow. On Android making a call is much simpler and the history seems to have no limit on the number of calls displayed. I’ll take Milestone again! 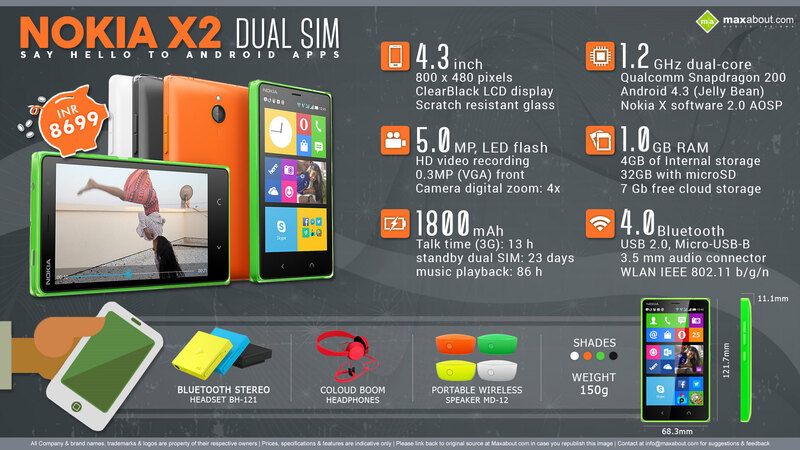 Conclusion: I did the exchange of the N97 by Motorola Milestone soon after realizing some of the points I have listed in this comparison. Comparing the two hands aside for less than half an hour I could see how much Milestone is better. In the opera summary, the Motorola Milestone is even far superior to the Nokia N97, and will look even better when you leave Android 2.2. Did you like the comparative? Leave your opinion or ask questions! Hope this helps!